Archaeologists conducting excavations near the Polish village Barczewko have discovered the skeleton of a man killed in 1354 during the Lithuanian invasion. This place is called the “Pompeii of Warmia” because the ruins of the city destroyed during the invasion are preserved intact. According to Dr. Arkadiusz Koperkiewicz of the University of Gdańsk, who leads the research at Barczewko, the find is yet another confirmation of the unique nature of this archaeological site, which is an invaluable source of knowledge about the beginnings of colonization in Warmia. 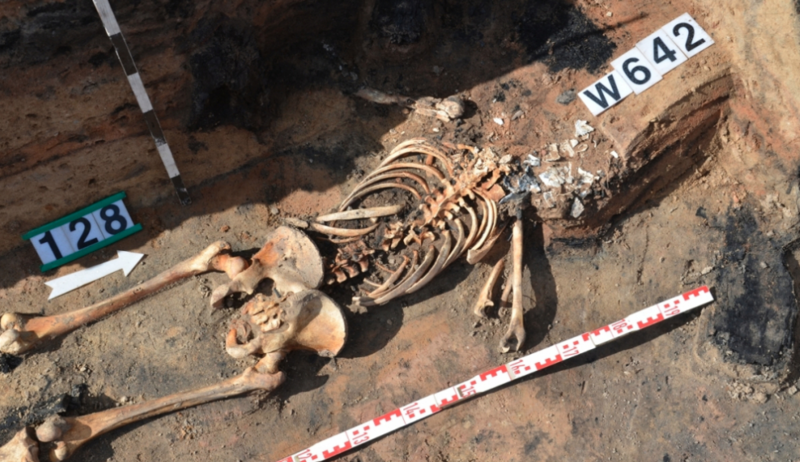 The skeleton of a man who died almost 700 years ago during the destruction of one of the oldest cities in Warmia was discovered in the basement of a building burnt down in the 14th century. Due to the conditions in the ruins, the remains were preserved in very good condition. This is the fourth season of archaeological work in a place where, during the colonization of the southern part of the Warmia Dominion, Bishop Eberhard of Nysa attempted to build the city of Wartenburg around the year 1330. It was the first location of today’s Barczewo. Scientists call it the “Pompeii of Warmia” because the city was completely destroyed at an early stage of development in 1354 by a cataclysm, in this case the invasion of the Lithuanian army of princes Kiejstut and Olgierd. The place has never been inhabited again, and the ruins of the young colony have survived for centuries in an unchanged form. According to archaeologists, it is a “time capsule” that has preserved a complete picture of the tragic events of the past. During this year’s research, more construction elements were unveiled. This is expected to help determine the location of the church, the last missing element of the spatial arrangement of the city. Archaeologists also found traces of the battle from the time of the Lithuanian invasion, including a huge number of arrowheads and crossbow bolts, some of them still in the charred remnants of wooden building structures. Many other relics have also been discovered, including fragments of a medieval cross and numerous silver and bronze ornaments. Archaeologists also continued research in the cemetery located in the north-eastern part of the settlement. In addition to items of clothing, decorations and other equipment of the graves, they discovered items associated with the funeral rituals. The dead were buried in coffins with hands on their hips and their heads arranged – according to the Christian custom – to the west. The items found in one of the children’s graves could allow for the reconstruction of clothing from that time and trace the details of the funeral ritual of the first Christians in this area. The objects found in the grave include a miniature jug, a piece of a clay pot, items of clothing and coins. According to Dr. Koperkiewicz, eschatological functions (connected with the Christian image of posthumous life) could be attributed to bracteates – Teutonic coins from the mid-fourteenth century, with the image of the cross. “Fragments of broken ceramic vessels were also placed in the graves. This could be a symbolic reference to the condition of the body and the fragility of human life” – he added. Archaeologists hope that important information will be provided by anthropological research on the discovered remains of the first settlers in Warmia and the comparison of these results with the research conducted at other cemeteries from that period, for example in Bezławki, where Christianised Prussian autochthons were buried. Isotopic research and analysis of the so-called ancient DNA will allow to draw conclusions about migration or determine kinship. The former town of Alt Wartenburg was located between Lake Wadąg and the river Orzechówka, about 5 kilometres from today’s Barczewo. It was probably inhabited by settlers from Silesia. Thanks to historical sources, we know the names of some residents: the parish priest Henryk and the mayors – brothers Jan and Piotr. Foundation records of the city are included in the chronicle of the Prussian lands of Peter of Dusburg, and the circumstances of its destruction are confirmed in the chronicle of Wigand of Marburg, who described the struggles of the Teutonic Knights with the Prussians and the Lithuanians. Archaeologists were able find this place thanks to the analysis of aerial photographs and plant anomalies occurring in the area. For the fuller understanding of the spatial layout of the old city, they also used geophysical and other non-invasive techniques. Excavations near Barczewko will continue in the coming years. They are part of the Polish-German research project of archaeologists from the University of Gdańsk and the University of Greifswald represented by Dr. Feliks Biermann. This year, archaeologists from Denmark and a group of Lithuanian PhD students from the University of Klaipeda also participated in the excavations. According to archaeologists, the research conducted in this place has a great cognitive value not only in the context of the beginnings of the mechanism of the formation of cities and the pioneer stage of colonization of Warmia, but also the process of urbanization in Central and Eastern Europe. According to Dr. Koperkiewicz, about 10-15% of the archaeological site has been studied during the four seasons of work. Some of the relics found in the “Pompeii of Warmia” will be displayed next year at exhibitions in Magdeburg, Prague and Malbork.